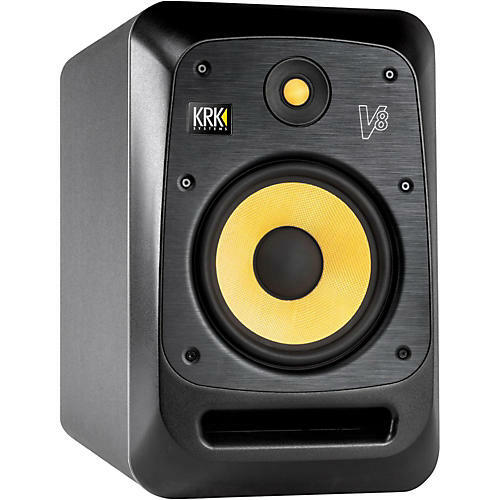 KRK Systems V Series 8 nearfield studio monitors are designed for audio production applications where accurate reproduction is critical. KRK worked with hundreds of pro engineers/producers/mixers to develop these monitors, and the result is a versatile, great-sounding pair of monitors that are both affordable and usable in professional environments. Recording and broadcast studios as well as sound design and audio production houses will benefit from adding the V Series 8 as the go-to monitor of choice. V-Series 8 includes 49 user selectable EQ settings to ensure proper setup for room acoustics and placement anomalies as well as taste and individual preference. The KRK design team has painstakingly modeled and analyzed hundreds of monitor placement and room acoustic situations to ensure that KRK delivers the most useful tools with minimal adjustments. Please call for a Return Authorization number before returning any product for repair. For the safest possible return to KRK, please use the shipping carton and packaging that your monitor was originally shipped in. KRK cannot be responsible for any damages incurred during the shipping process due to poor packing. Make sure to insure your shipment. If your monitor is out of warranty and you would like a quotation prior to servicing your product, please include a note with your contact information on it and we will contact you with a service quote. Service will be performed once your method of payment has been established and approved. Replacement carton and packaging can be purchased from KRK Systems, LLC. $18.00 per carton. For replacement part quotes call (818) 534.1575.